The InspirationalPlanner is the perfect hybrid for planning and taking notes. 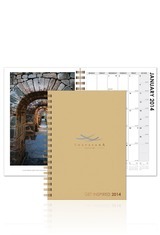 A 12-month planner with full-color images and quotes are in the front, followed by 70 sheets of ruled filler. Everything you need in one tool! Call for higher quantities. Price includes one-color foil imprint up to 16” sq. Setup fee $52.50 G. Standard turnaround 10-15 business days. Actual pre-production sample available for $112.50 G.